Like so many others, we watch a lot of college football around New Year’s. This year, our very own Fighting Illini were in the party again, making it to one of those also-ran Bowls: The Zaxby’s Heart of Dallas Bowl. 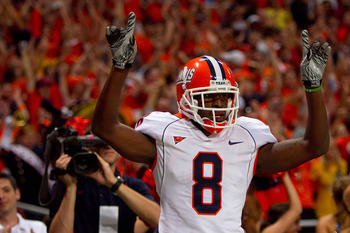 Illinois lost 35-18 and probably should have won – though you wouldn’t know it by the score. With all these bowl games, especially in light of the inaugural 4-team playoff, the sports talkers have been discussing bowl viability, money, TV contracts, etc., and as we sit here watching Oregon pound Florida State, we have some thoughts as well. If you’re among those who think that the major conference re-shuffling and re-jiggering is horrible, look no further than the now-departed BCS system. Between the BCS contract and the guaranteed conference contracts to various bowls, the Big 10, Pac 12, SEC, and ACC had ample motivation to expand. More money. More prestige. More TV markets. Now that we’ve finally entered the playoff era, there’s a chance the system could correct itself over time. Six automatic conference qualifiers, your champions from the six current BCS conferences. That would be SEC – LSU, Pac 10 – Oregon, Big 10 – Wisconsin, Big 12 – Oklahoma State, ACC – Clemson, and Big East (cough, cough) – West Virginia. Two at-large conference qualifiers, the champions of the next two highest rated conferences. This year that’s the Mountain West – TCU, and Conference USA – Southern Miss. Some years you might get a WAC or MAC team in here. Eight at-large teams, selected from the remaining highest rated teams using the BCS formula. No limits on the number of entries from a conference. This year your at-large teams are: Alabama, Stanford, Arkansas, Boise State, Kansas State, South Carolina, Virginia Tech, and Baylor. 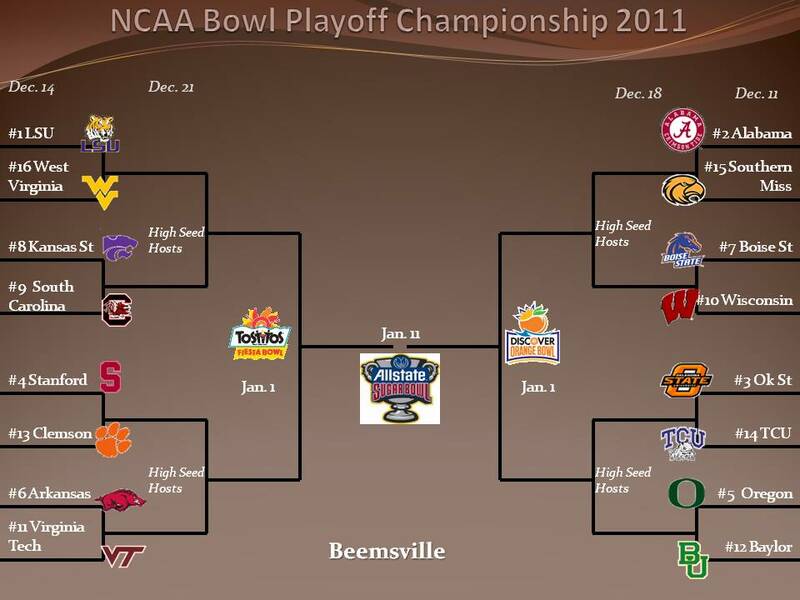 Teams are seeded according to BCS formula. #1 to #16 based on relative ranking. Higher seeds host the first round; highest surviving seeds then host the second round. Bye week over Christmas. 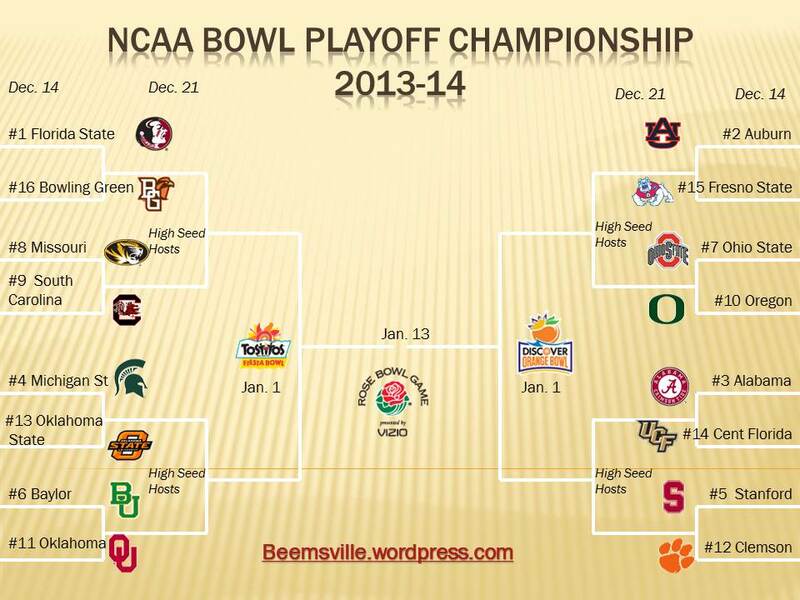 Semi-finals and the final rotate between the four BCS bowl sites. Jan. 1 is your semi-final date. This year the Sugar Bowl gets the championship on Jan. 10. Illini fans cursing the television Saturday, while Illinois shuffled to another lethargic loss at Purdue, saw a familiar theme of the last decade or so. It was the inexplicable letdown, the inconsistency, the ability to lose when you should win. No one would blame said fans for typing a quick email to new Athletic Director, Mike Thomas: This is why you can’t get a sellout. This is what you’re up against. Do something about it. Illiniois’ 17-7 loss to Ohio State was the first of the year, but with schedule shifting towards the perilous and the team continuing to make the same kinds of mistakes, it surely won’t be the last. This game was there for the taking. The Buckeyes weren’t very good, completing a single pass on the day (albeit for a touchdown), but the Illini were worse. Coach Luke Fickell seemed to be following the script of earlier foes: play it close and vanilla and wait for Illinois to screw up. Which is just what happened. Across the street, Bruce Weber’s basketball team opened practice before the game with an open scrimmage. Expectations are low to middling, with lots of new players, a transfer point guard who has health issues (Sam Maniscalco), and a highly athletic but inexperience center in Myers Leonard. Swingman Brandon Paul figures to be the go-to guy on offense, but the team will stress defense first and attempt to ratchet up the pressure. Hey – they should be an interesting group to watch. The schedule is soft, and if they can win some close games they could be OK; if not, Bruce already has his excuses ready to go. In a flip of the standard script, the Fighting Illini are 6-0 after last weekend’s victory over Indiana, while Ohio State is 3-3 and just completed a disheartening 2nd half collapse at Nebraska. The Buckeyes are reeling right now, with a new inexperienced coach, quarterback problems, and the still looming but unlikely possibility of more NCAA sanctions. But, as anyone in the Big 10 can tell you, athlete for athlete, they are still at the top of the conference for talent. I don’t follow the Vegas lines, but if I did I’d keep a close eye on this one. Illinois might be favored this game, but not in my book.